Bronchial thermoplasty (BT) is a modality for treating asthma and is thought to prevent the chronic structural changes that occur in airway smooth muscle (ASM) in individuals with asthma. BT targets ASM via the delivery of a controlled specific amount of radiofrequency (RF) energy (RF ablation [RFA]) to the airway wall through a dedicated catheter. Though patients with severe asthma constitute 5-10% of the asthma population, severe asthma consumes a disproportionate percentage (~50%) of the global asthma budget, secondary to unscheduled physician visits, emergency department (ED) visits, and hospitalizations, along with the costs of pharmacotherapy. Because BT is associated with a very high direct cost, insurance coverage has been a prominent issue. In the United States, BT is covered by multiple commercial payers. It is also covered by multiple, though not all, health plans, and some health plans that do not routinely cover it may still consider it on a case-by-case basis and provide coverage on the basis of case-specific medical necessity. Payers with noncoverage policies have typically used a number of reasons for maintaining such policies. Many plans have described BT as an “experimental and investigational” procedure, suggesting that further study is necessary before coverage is appropriate. It is always recommended that patients confirm commercial insurance coverage before starting this therapeutic modality. Candidates for bronchial thermoplasty include adults with severe persistent asthma who require regular maintenance medications of inhaled corticosteroids (>1000 µg/day of beclomethasone or the equivalent) and a long-acting beta agonist (≥100 µg/day of salmeterol or the equivalent). These patients would have received add-on therapies such as leukotriene modifiers, omalizumab, or oral corticosteroids (≤10 mg/day). These patients should be on stable maintenance asthma medications according to accepted guidelines,  should have a prebronchodilator forced expiratory volume in 1 second (FEV1) of 60% or more of predicted, and should have a stable asthma status (FEV1 within 10% of the best value, no current respiratory tract infection, and no severe asthma exacerbation within the preceding 4 weeks). Other modalities with the potential to replace biopsy in this setting are optical coherence tomography (OCT) and confocal microscopy (CFM) with or without high-resolution radial balloon-based endobronchial ultrasonography (US). OCT allows real-time microscopic evaluation of the mucosae and submucosae during bronchoscopy. Radial endobronchial US has also been used to evaluate changes in wall thickness and wall remodeling. Both of those modalities seem to be valuable tools, but further evaluation is warranted. Many of these add-on medications are expensive, have substantial side effects, and require adherence to daily administration or monthly or biweekly injections. These agents reduce inflammation or decrease airway narrowing by relaxing ASM but do not prevent the chronic structural changes that occur in ASM in individuals with asthma. Therefore, an alternative therapy is needed for this population. BT is believed to provide a solution for this unmet need. In 2014, a European Respiratory Society (ERS)/American Thoracic Society (ATS) task force strongly recommended consideration of BT for adults with severe asthma in the context of an institutional review board (IRB)-approved systematic registry or as part of a clinical study. The quality of evidence behind this recommendation was labeled as very low, in that BT was considered as an add-on resource without a firm understanding of adverse effects, appropriate patient selection, or the degree of improvement in symptoms and quality of life to be expected. One theory to explain the effect of BT is that “pacemakers” within the proximal airways control ASM contractility and that BT ablates these controlling centers, leading to the distal effect. Another theory is that a particular asthma phenotype includes a prominent component of large-airway inflammation and that modification of the adjacent structure in the airway leads to decreased mucous gland hyperplasia, reduced mucus production, and altered airway autonomic tone, which may contribute to the response to BT. Patients are expected to have respiratory-related adverse events such as cough, wheezing, and chest tightness during the treatment period. Most of these symptoms occur within 1 day of the procedure and resolve in an average of 7 days with standard therapy. Kheir F, Majid A. Bronchial Thermoplasty: A Nonpharmacologic Therapy for Severe Asthma. Clin Chest Med. 2018 Mar. 39 (1):261-269. [Medline]. Global strategy for asthma management and prevention. Global Initiative for Asthma. Available at https://ginasthma.org/wp-content/uploads/2018/04/wms-GINA-2018-report-V1.3-002.pdf. 2018; Accessed: March 8, 2019. [Guideline] British Thoracic Society., Scottish Intercollegiate Guidelines Network. British guideline on the management of asthma. Thorax. 2014 Nov. 69 Suppl 1:1-192. [Medline]. [Full Text]. Barnes PJ, Woolcock AJ. Difficult asthma. Eur Respir J. 1998 Nov. 12 (5):1209-18. [Medline]. [Full Text]. Dolan CM, Fraher KE, Bleecker ER, Borish L, Chipps B, Hayden ML, et al. Design and baseline characteristics of the epidemiology and natural history of asthma: Outcomes and Treatment Regimens (TENOR) study: a large cohort of patients with severe or difficult-to-treat asthma. Ann Allergy Asthma Immunol. 2004 Jan. 92 (1):32-9. [Medline]. [Full Text]. Kukulj S, Serdarevic M, Popovic-Grle S. [Pharmacotherapy of severe asthma]. Lijec Vjesn. 2013 Sep-Nov. 135 (9-10):268-73. [Medline]. [Full Text]. Moore WC, Bleecker ER, Curran-Everett D, Erzurum SC, Ameredes BT, et al. Characterization of the severe asthma phenotype by the National Heart, Lung, and Blood Institute's Severe Asthma Research Program. J Allergy Clin Immunol. 2007 Feb. 119 (2):405-13. [Medline]. [Full Text]. Miller RJ, Murgu SD. Interventional pulmonology for asthma and emphysema: bronchial thermoplasty and bronchoscopic lung volume reduction. Semin Respir Crit Care Med. 2014 Dec. 35 (6):655-70. [Medline]. [Full Text]. Siddiqui S, Gonem S, Wardlaw AJ. Advances in the management of severe asthma. Semin Respir Crit Care Med. 2012 Dec. 33 (6):666-84. [Medline]. [Full Text]. Menzella F, Zucchi L, Piro R, Galeone C, Castagnetti C, Facciolongo N. A budget impact analysis of bronchial thermoplasty for severe asthma in clinical practice. Adv Ther. 2014 Jul. 31 (7):751-61. [Medline]. [Full Text]. Singh SK, Tiwari KK. Bronchial thermoplasty: a non-pharmacological approach. Clin Respir J. 2015 Apr 27. 35 (6):655-70. [Medline]. [Full Text]. Cangelosi MJ, Ortendahl JD, Meckley LM, Bentley TG, Anene AM, Shriner KM, et al. Cost-effectiveness of bronchial thermoplasty in commercially-insured patients with poorly controlled, severe, persistent asthma. Expert Rev Pharmacoecon Outcomes Res. 2015 Apr. 15 (2):357-64. [Medline]. [Full Text]. Tan LD, Kenyon N, Yoneda KY, Louie S. Bronchial thermoplasty: implementing best practice in the era of cost containment. J Asthma Allergy. 2017. 10:225-230. [Medline]. [Full Text]. National Asthma Education and Prevention Program. Expert Panel Report 3 (EPR-3): Guidelines for the Diagnosis and Management of Asthma-Summary Report 2007. J Allergy Clin Immunol. 2007 Nov. 120 (5 Suppl):S94-138. [Medline]. [Full Text]. Blaiss MS, Castro M, Chipps BE, Zitt M, Panettieri RA Jr, Foggs MB. Guiding principles for use of newer biologics and bronchial thermoplasty for patients with severe asthma. Ann Allergy Asthma Immunol. 2017 Dec. 119 (6):533-540. [Medline]. Gordon IO, Husain AN, Charbeneau J, Krishnan JA, Hogarth DK. Endobronchial biopsy: a guide for asthma therapy selection in the era of bronchial thermoplasty. J Asthma. 2013 Aug. 50 (6):634-41. [Medline]. [Full Text]. Andrychiewicz A, Gorka K, Reid M, Soja J, Sladek K, Szczeklik W. Modern methods for the endoscopic treatment of obstructive pulmonary diseases. J Asthma. 2015 Jan 13. 50 (6):1-19. [Medline]. [Full Text]. Cox G, Miller JD, McWilliams A, Fitzgerald JM, Lam S. Bronchial thermoplasty for asthma. Am J Respir Crit Care Med. 2006 May 1. 173 (9):965-9. [Medline]. [Full Text]. Castro M, Rubin AS, Laviolette M,et. al. Effectiveness and safety of bronchial thermoplasty in the treatment of severe asthma: a multicenter, randomized, double-blind, sham-controlled clinical trial. Am J Respir Crit Care Med. 2010 Jan 15. 181 (2):116-24. [Medline]. [Full Text]. Pavord ID, Cox G, Thomson NC, Rubin AS, Corris PA, Niven RM, et al. Safety and efficacy of bronchial thermoplasty in symptomatic, severe asthma. Am J Respir Crit Care Med. 2007 Dec 15. 176 (12):1185-91. [Medline]. [Full Text]. [Guideline] Chung KF, Wenzel SE, Brozek JL, Bush A, Castro M, Sterk PJ, et al. International ERS/ATS guidelines on definition, evaluation and treatment of severe asthma. Eur Respir J. 2014 Feb. 43 (2):343-73. [Medline]. [Full Text]. Danek CJ, Lombard CM, Dungworth DL, Cox PG, Miller JD, Biggs MJ, et al. Reduction in airway hyperresponsiveness to methacholine by the application of RF energy in dogs. J Appl Physiol (1985). 2004 Nov. 97 (5):1946-53. [Medline]. [Full Text]. Miller JD, Cox G, Vincic L, Lombard CM, Loomas BE, Danek CJ. A prospective feasibility study of bronchial thermoplasty in the human airway. Chest. 2005 Jun. 127 (6):1999-2006. [Medline]. [Full Text]. Woodruff PG, Dolganov GM, Ferrando RE, Donnelly S, Hays SR, Solberg OD, et al. Hyperplasia of smooth muscle in mild to moderate asthma without changes in cell size or gene expression. Am J Respir Crit Care Med. 2004 May 1. 169 (9):1001-6. [Medline]. [Full Text]. Bai TR, Cooper J, Koelmeyer T, Paré PD, Weir TD. The effect of age and duration of disease on airway structure in fatal asthma. Am J Respir Crit Care Med. 2000 Aug. 162 (2 Pt 1):663-9. [Medline]. [Full Text]. Doherty DE. The pathophysiology of airway dysfunction. Am J Med. 2004 Dec 20. 117 Suppl 12A:11S-23S. [Medline]. [Full Text]. Matsumoto H, Moir LM, Oliver BG, Burgess JK, Roth M, Black JL, et al. Comparison of gel contraction mediated by airway smooth muscle cells from patients with and without asthma. Thorax. 2007 Oct. 62 (10):848-54. [Medline]. [Full Text]. Janssen LJ. Airway smooth muscle as a target in asthma and the beneficial effects of bronchial thermoplasty. J Allergy (Cairo). 2012. 2012:593784. [Medline]. [Full Text]. Dyrda P, Tazzeo T, DoHarris L, Nilius B, Roman HN, Lauzon AM, et al. Acute response of airway muscle to extreme temperature includes disruption of actin-myosin interaction. Am J Respir Cell Mol Biol. 2011 Feb. 44 (2):213-21. [Medline]. [Full Text]. Hamid Q, Song Y, Kotsimbos TC, Minshall E, Bai TR, Hegele RG, et al. 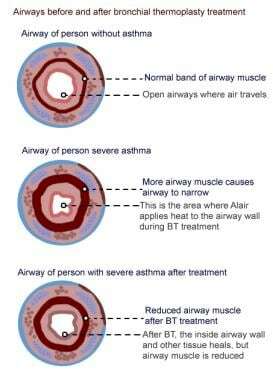 Inflammation of small airways in asthma. J Allergy Clin Immunol. 1997 Jul. 100 (1):44-51. [Medline]. [Full Text]. Kraft M. The distal airways: are they important in asthma?. Eur Respir J. 1999 Dec. 14 (6):1403-17. [Medline]. [Full Text]. Ingram RH Jr, McFadden ER Jr. Localization and mechanisms of airway responses. N Engl J Med. 1977 Sep 15. 297 (11):596-600. [Medline]. [Full Text]. Chachi L, Gavrila A, Tliba O, Amrani Y. Abnormal corticosteroid signalling in airway smooth muscle: mechanisms and perspectives for the treatment of severe asthma. Clin Exp Allergy. 2015 Nov. 45 (11):1637-46. [Medline]. [Full Text]. Jesudason EC. Airway smooth muscle: an architect of the lung?. Thorax. 2009 Jun. 64 (6):541-5. [Medline]. [Full Text]. Kirby M, Ohtani K, Lopez Lisbona RM, Lee AM, Zhang W, et al. Bronchial thermoplasty in asthma: 2-year follow-up using optical coherence tomography. Eur Respir J. 2015 May 28. 50 (7):799-801. [Medline]. [Full Text]. Bonta PI, d'Hooghe J, Sterk PJ, Bel EH, Annema JT. Reduction of airway smooth muscle mass after bronchial thermoplasty: are we there yet?. Am J Respir Crit Care Med. 2015 May 15. 191 (10):1207-8. [Medline]. [Full Text]. Aubier M, Pretolani M, Chanez P, Thabut G, Debray MP, Taille C, et al. Reply: reduction of airway smooth muscle mass by bronchial thermoplasty in patients with severe asthma. Am J Respir Crit Care Med. 2015 May 15. 191 (10):1208-9. [Medline]. [Full Text]. Zanon M, Strieder DL, Rubin AS, Watte G, Marchiori E, Cardoso PFG, et al. Use of MDCT to Assess the Results of Bronchial Thermoplasty. AJR Am J Roentgenol. 2017 Oct. 209 (4):752-756. [Medline]. Thomen RP, Sheshadri A, Quirk JD, Kozlowski J, Ellison HD, Szczesniak RD, et al. Regional ventilation changes in severe asthma after bronchial thermoplasty with (3)He MR imaging and CT. Radiology. 2015 Jan. 274 (1):250-9. [Medline]. [Full Text]. Gudmundsson G, Gross TJ. Middle lobe syndrome. Am Fam Physician. 1996 Jun. 53 (8):2547-50. [Medline]. [Full Text]. Facciolongo N, Menzella F, Lusuardi M, Piro R, Galeone C, Castagnetti C, et al. Recurrent lung atelectasis from fibrin plugs as a very early complication of bronchial thermoplasty: a case report. Multidiscip Respir Med. 2015. 10 (1):9. [Medline]. [Full Text]. Balu A, Ryan D, Niven R. Lung abscess as a complication of bronchial thermoplasty. J Asthma. 2015 Mar 13. 2012:1-3. [Medline]. [Full Text]. d'Hooghe JNS, van den Berk IAH, Annema JT, Bonta PI. Acute Radiological Abnormalities after Bronchial Thermoplasty: A Prospective Cohort Trial. Respiration. 2017. 94 (3):258-262. [Medline]. [Full Text]. Alair™ RF Controller & Catheter. Courtesy of Boston Scientific. Bronchial thermoplasty catheter in airway. Bronchial thermoplasty, delivered by the Alair™ Bronchial Thermoplasty System. Courtesy of Boston Scientific.